Investigators released a report on missing Malaysia Airlines flight MH370 on Monday, saying the Boeing 777’s controls were likely deliberately manipulated to take it off course but they were not able to determine who was responsible. 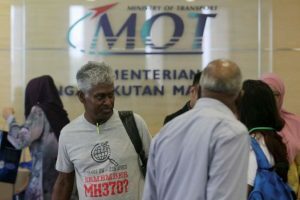 They had no conclusion about what happened aboard the plane that vanished with 239 people on board en route to Beijing from Kuala Lumpur on March 8, 2014, leaving one of the world’s greatest aviation mysteries unsolved. Malaysian and international investigators have been looking into why the Boeing 777 jet veered thousands of miles off course from its scheduled route before eventually plunging into the Indian Ocean. Experts believe someone may have deliberately switched off MH370’s transponder before diverting it over the Indian Ocean. The last communication from the plane was from the Captain Zaharie Ahmad Shah who signed off with “Good night, Malaysian three seven zero”, as the plane left the Malaysian airspace. A forensic report by the Malaysian police previously concluded that there were no unusual activities other than game-related flight simulations. “The one point they stressed was that this report was not to assign blame, it was only a safety investigation,” she said. The only confirmed traces of the aircraft have been three wing fragments washed up along the Indian Ocean coasts. Malaysia’s newly elected Prime Minister Mahathir Mohamad has said Malaysia would consider resuming the search for MH370 only if new clues come to light.